In Freedom of the Will, Erasmus concerns himself primarily with the role of “human will by which a man can apply himself to the things which lead to eternal salvation, or turn away from them.” In reading and interpreting Paul in his letter to the Romans, Erasmus understands Paul to be a champion of free choice who simultaneously understands salvation in terms of God’s prevenient mercy as well as humanity’s actions. 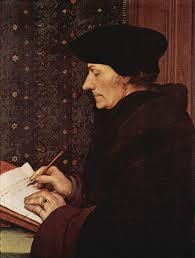 Erasmus also believes Paul in Romans to insufficiently treat the interaction between foreknowledge and will. Concerning Romans chapters nine through eleven, Erasmus understands Paul to be repressing the arrogance of Gentiles and Jews, as well as using illustrations such as potter and clay that do not indicate the normative status of the human will concerning salvation, but instead are concerned with addressing obstinate Jews who do not accept the gospel message of Christ by faith. To conclude, Erasmus understands Paul to present a soteriological construction that he can adhere to himself, namely, a balanced understanding of God’s grace and man’s grace-given free choice, that ultimately allows for human responsibility in choosing or rejecting salvation under the grace and power of God. A position taken by modern scholars as well, as we shall see below. Erasmus, On the Freedom of the Will, 66-67. Ibid., 70. Ibid., 71. Ibid., 81-5. Ibid., 85-97. Ibid., 96. Ibid., 47. A perspective affirmed by Bernhard Lohse as the summation of Erasmus’ soteriology in Martin Luther’s Theology: Its Historical and Systematic Development. Translated and Edited by Roy A. Harrisville. Fortress Press: Minneapolis, 1999. 161.